I'm excited to be working with Mark Burrell of Endeca on a virtual seminar about Search & Discovery Patterns. We'll be covering brand new material. Plus, everyone who registers gets a free copy of the butterfly book! Also, when you register, use code morville for free lifetime access to the recording for your organization. Please spread the word. Happy Holidays! 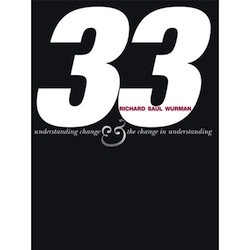 Have you read 33 by Richard Saul Wurman? If so, I'd love to hear your reaction. By happenstance, I was on the phone with Mr. Wurman recently. He asked for my opinion, and I had a hard time responding. The word that popped out, eccentric, was intended as a compliment. But, I really did enjoy the book, especially the Structure of Instruction episode and, of course, the Information Architect episode. The Commissioner of Curiosity and Imagination loved information but knew that information that didn't inform wasn't information - it was data, non-information. He was, as he liked to call himself, an Information Architect, in fact the original Information Architect, since the time the little fellow chaired the American Institute of Architects' 1976 national convention with the theme The Architecture of Information. And that's why I've chosen to call myself an Information Architect! he told the gathering. I don't mean a bricks-and-mortar architect. I mean architect as in the creating of systemic, structural and orderly principles to make something work - the thoughtful making of either artifact, or idea, or policy that informs because it is clear. The Information Age has been in existence for more than two decades now and yet, does it inform? the Commissioner asked. And yet, through this field of black volcanic ash has come a group of people, small in number, deep in passion, called Information Architects, who ply their trade, make themselves visible and develop a body of work on paper, in electronic interfaces, in some extraordinary exhibitions. These people are now and they are the future. It's a tough book to describe. Eccentric is my word. What's yours?